Who really needs a travel jacket? We all do!!! Traveling with perfect weather is the dream. If every day could be warm and sunny with just a little bit of a breeze, I think most of us would be on cloud nine. But that’s rarely the reality. Truthfully, not only are some cold-weather destinations like Iceland absolutely beautiful, but it can also be cheaper to travel certain places during the low season when the weather is kind of yucky. Even if you’re traveling somewhere warm, it’s still important to bring a jacket. Warm destinations are notorious for blasting the air conditioning wherever you go, tropical climates are known for their rain showers, and temperatures may even drop once the sun sets. Our comprehensive buying guide featuring the best jackets for travel is designed to help you pick the best travel jacket for your adventures. 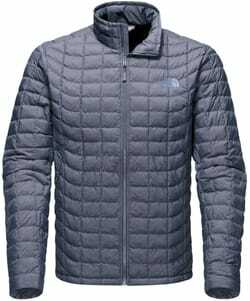 Below is a list of the best jackets for travel. Click on the name to read reviews and check prices. What’s the weather like where you’re going to be? Will you need extra layers? While style and fashion are important, you don’t want to be sweating or freezing just because the jacket looks nice. Make sure you know whether its designed to be a cold-weather, cool-weather, or rain jacket before you buy it. Some travel jackets even have removable layers, so if you’re taking in the best of Cusco and are going to be there for a while, then a 3-in-1 jacket with removable layers might be the perfect answer for the changing weather conditions. The stereotype used to be that men’s jackets were warm and bulky, while women’s jackets were stylish but not very warm. Thankfully, the best travel jackets for men and women have crushed that stereotype, and finding a warm and lightweight travel jacket is only a few scrolls down. If you’re anything like me, your suitcases are always in danger of being overweight. No matter the warmth, the best travel jackets are going to be lightweight and easy to pack. Even some of the best cold-weather jackets will fold into their own pockets, giving you more space in your luggage. As travelers, it can be easy for us to want to save money, but make sure you don’t short change yourself on a travel jacket. There’s nothing worse than a zipper breaking or a pocket tearing in the middle of an adventure. The best travel jackets are usually made with nylon, polyester, and other synthetic products to ensure both warmth and durability. Even after going with you on some rugged adventures, your travel jacket shouldn’t look any worse for the wear. While choosing a comfortable travel jacket goes without saying, picking a size can be a little trickier to figure out. One thing to keep in mind about comfort is ensuring the jacket is breathable, so if you’re active you won’t overheat. Read the reviews on your travel jacket before buying it to see what others say about the size and the fit. Another thing to consider is how many layers you’ll be putting underneath. Do you want to travel with a lot of devices in your pockets? That will add to the tightness of the jacket. Depending on your travel style, it might be a good idea to purchase one size bigger than what you normally wear so you won’t be restricted if you layer or have electronics in your pockets. Don’t buy a “rain jacket” without making sure it’s waterproof or at least water resistant. I have a rain jacket with a logo stitched into it. I was at a football game many years ago and it was pouring, and the rain started to seep through the stitching in the logo. So definitely double check things like water, wind, and dirt resistance. Many travel jackets, even the bright colored ones, are designed to minimize stains to keep you looking great throughout your adventures. If staining is a concern, then it’s probably better to go with a darker color like black, navy blue, or brown. This is essential, especially if you’re going to be on-the-go a lot. When hung correctly, the best travel jackets should dry quickly so you don’t have to put on a soggy jacket for your next event. The synthetic materials not only help it to dry faster, but your jacket also won’t collect odors as easily as natural materials do. It’s much easier to choose the best travel jacket when fully educated, and one of the places where people get tripped up is the difference between soft shell and hard shell jackets. The short answer is hard shell jackets are designed to provide full weather protection (waterproof, windproof, etc.) while soft shell jackets are geared toward ensuring breathability, flexibility and maximum movement when you’re active. The problem is with so many technology advances in fabrics we’re seeing a meshing of materials, which can make choosing a travel jacket even more difficult. Some jackets look like a soft shell, but perform like a hard shell. It’s best to check the materials used and ensure they’ll work with the type of weather and activity you’ll be facing. 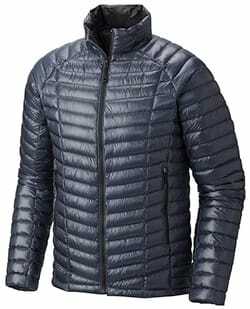 With fabric so rare it can only be woven at one mill in the world, the Ghost Whisperer Down Jacket is the lightest full-featured down jacket in the world. 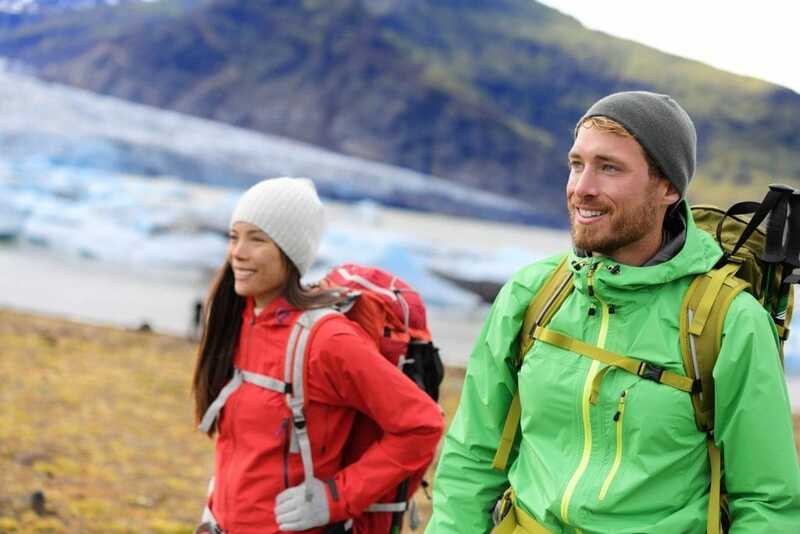 Designed for both men and women, it’s the best lightweight jacket for travel because it’s waterproof, windproof, and it zips into its own pocket for easy storage. Perfect for active travelers because of its thoughtful additions, it has conveniences like a built-in loop for carabiner attachments so it’s always secure when packed. Weighing around 7.2oz for the men and 6.6oz for the women, don’t let the weight fool you, if you need to be warm the Ghost Whisperer Down Jacket is the best travel jacket ever. North Face doesn’t disappoint with their revolutionary Thermoball technology. 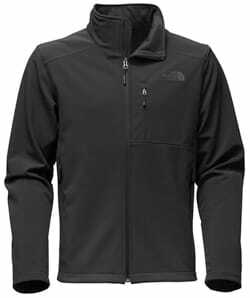 Whether you’re going on a backpacking trip or simply looking for the best travel jacket for Europe and its rough winters, the North Face Thermoball is a great answer. With a down fill rating of 600 and only weighing between 10.5oz and 12.3oz, it’s super warm and water-resistant, it’s even designed to keep you warm when it’s wet. Planning to be on the move? It can easily be packed into its hand pocket. Not only that, but the North Face Thermoball comes in more than 11 colors, so you can be warm and stylish. 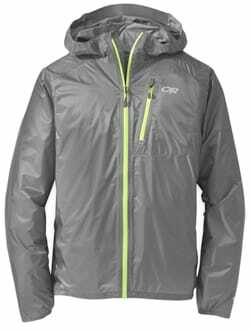 While the North Face Thermoball is ranked as one of the best lightweight travel jackets for cold weather, the North Face Resolve 2 highlights your options for the best travel rain jacket. Their DryVent technology is a tri-component, multi-layer feature that allows the jacket to be breathable while still protecting you from the rain and the wind. Once the rain stops, the hood conveniently stows away in the collar. Boasting a variety of colors for both men and women as well as a lifetime guarantee, it’s not hard to see why the North Face Resolve 2 is one of the best travel jackets on the market. The Columbia Bugaboo Interchange Jacket may just be the ultimate travel jacket. The 3-in-1 jacket provides guaranteed warmth with its nylon shell, nylon lining, and polyester fleece liner when you’re battling the elements. The layers are effective by themselves or together, giving the freedom to zip any layer on or off depending on the weather and temperature. The polyester fleece and nylon combine to provide the best in thermal reflective warmth and breathability. In addition, it’s also a great jacket with pockets for travel because of its interior security pocket and media pocket, ensuring you can easily access your phone, passport, and more whenever necessary. When facing unpredictable weather, the Columbia Bugaboo Interchange Jacket will always have your back. 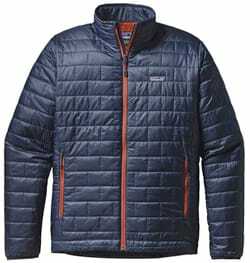 Trapping heat and blocking wind are two things the Patagonia Nano Puff does better than almost any other jacket. When you combine that with its other features, it makes it one of the best options for choosing a travel jacket. It comes with three zipper garages, two for the handwarmer pockets and one at the chin, as well as an adjustable hem to hold in as much heat as possible. Weighing no more than 12oz, it’ll be super easy to pack for your next adventure. When temperatures are hovering between cool and freezing, this is the perfect jacket. This men’s travel jacket is totally windproof and the soft shell is ideal for layering during your favorite cool-weather activities. The relaxed fit makes it super comfy whether you’re sitting on an airplane, hiking, or exploring a new city, and the zipper pockets make it easy to keep your hands warm and store your most important stuff. 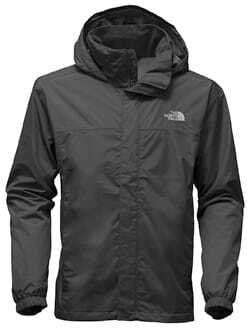 Whether you’re purchasing the jacket for yourself or for your favorite outdoorsmen, you can’t go wrong with the North Face Apex Bionic. 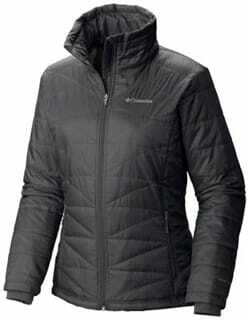 Tried and true, the Columbia Kruser Ridge is one of the best travel jackets for women you’ll find. Not only is the jacket water and wind resistant, but it’s also stain repellent so you’ll look your best throughout your adventures. It’s one of the ultimate travel jackets because it’s lightweight but can withstand so many different types of weather. You can travel around the world, from Argentina to Greece or from the United States to New Zealand, and not have to worry about bringing more than one jacket. 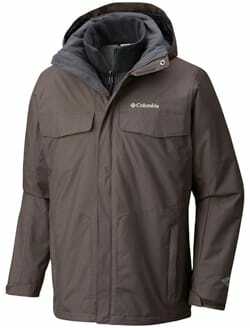 Available in a variety of stylish colors, the Columbia Kruser Ridge may just be the last travel jacket you buy. Even though it’s mighty light, it keeps its wearers mighty warm. Long gone are the days when women had to buy a bulky men’s coat just to stay warm. 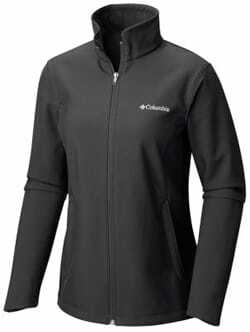 The Columbia Mighty Lite III comes in a layered and feminine style designed to provide the best insulation. Heading somewhere cold and trying to think about the best jacket for travel? Look no further than the Columbia Mighty Lite III. This women’s travel jacket is not only lightweight and fits easily into a suitcase, but it has all the necessary travel conveniences, like an interior security pocket and comfort cuffs. The thumb holes continue to be a fan favorite as they keep cold air out of the sleeves. With a shell, lining, and insulation strategically designed for warmth, this is the go-to jacket for women when the temperatures start to fall. 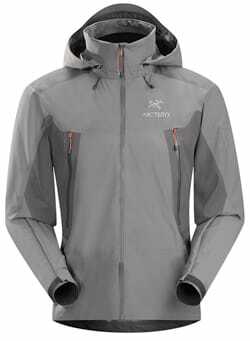 If you’re doing anything outdoors, make sure to consider the Arc’teryx Beta LT Hybrid. The minimalist style is designed for maximum versatility no matter what you have on your schedule for the day. The jacket boasts a top-of-the-line waterproof shell that never disappoints. One of the best lightweight rain jackets for travel, it also super durable, windproof, and breathable. The thoughtful design is made to enhance comfort and ensure unrestricted mobility. When it does start to rain, we all hate when we put a hood on and 50% of our vision is gone. Thankfully, the Arc’teryx Beta LT Hybrid and its trademarked hood provided total coverage without interfering with our sightlines. It’s no wonder why people call it the best waterproof jacket for traveling. The list of the best packable raincoats for travel isn’t complete without the Outdoor Research Helium II. First of all, it’s crazy light, weighing only 6.4oz or less, and it’s super simple to pack into a jersey pocket or just clip to a harness. It really has everything you could want in a rain jacket and more – it’s fully seam-taped and has laminated construction, YKK® AquaGuard® Zippers, and an internal pocket that doubles as a stuff sack. It’s so light you’ll forget you’re even carrying it, but as soon as that flash storm hits, you’ll be glad you have it. It comes in a variety of fun colors, so whether you’re looking for a men’s or women’s travel jacket for the rain, the Outdoor Research Helium II will have you covered. There’s no more need to worry about packing a sweatshirt for the airplane, a raincoat for your excursions, and a nice coat to wear when you paint the town. Now that you know the best travel jackets on the market, you can be warm for all of your adventures without having to weigh down your luggage.